There’s a certain pleasure in seeing a familiar job done well with a slightly new mix of tools, and that’s just what “Safe House” is. There’s not much new about this CIA double-cross story, but the setting, actors, cinematography, and story details are a new combination, and it’s enjoyable watching familiar gears mesh and turn in the new setup. 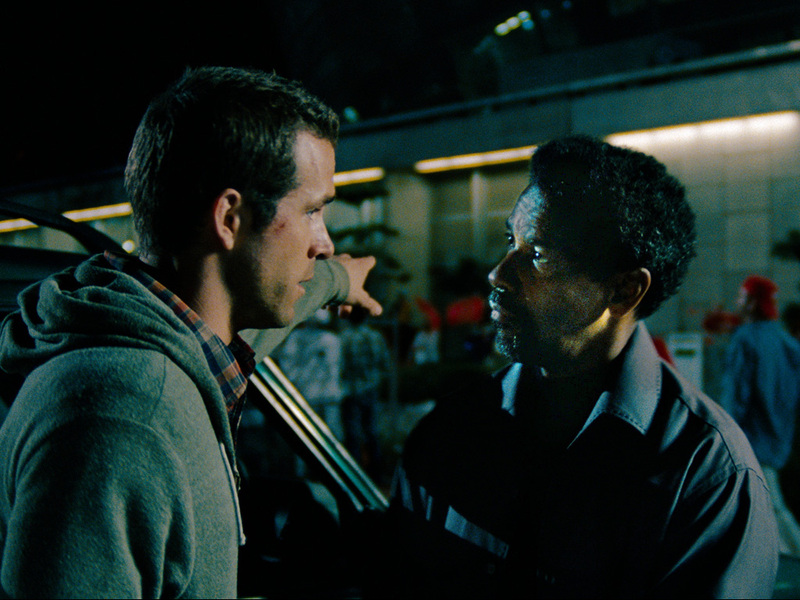 Matt Weston (Ryan Reynolds) is a young CIA agent stuck in a dead-end job: housekeeping. He spends his days sitting in a safe house in South Africa, keeping things ready in case the Agency has someone to bring in. After more than a year bored out of his mind, he gets more action than he can handle: notorious rogue CIA agent Tobin Frost (Denzel Washington) has resurfaced after a decade under the radar and the safe house he’s brought to is Weston’s. The interrogation conducted by the escorting Agency team (led by Robert Patrick — it’s a pleasure seeing him on the big screen again) is interrupted when mercenaries blow down the door and try to capture Frost. Weston knows his primary responsibility is the safety of the guest in his house, so he takes Frost and runs. Unsurprisingly, it turns out that not everything is what it seems, and Weston is in way over his head. Frost gives the young man an education in the realities of working for the Agency while following his own mysterious agenda. The mentor/student relationship underlying Weston and Frost’s enmity seems likely to parallel real life here, with the very experienced Washington sailing calmly through his role while Reynolds, no slouch himself, struggles to keep up. Washington’s performance is as casual and spot-on as Frost is himself, and it’s a joy to watch the way his light touch brings the enigmatic Frost to life. Reynolds is solid, and handles the transformation of his character from untested rookie to experienced agent well. The requisite car chases, gunfights, and hand-to-hand showdowns are all top-notch, and closeups are blended with enough long-shots that you can mostly tell what’s going on. That aside, the biggest weakness of the film is its cinematography. If you don’t like hand-held camerawork, low-resolution film, and frequent low lighting (to the point that the audience sometimes can’t see much more than the characters can), “Safe House” will drive you batty. It adds to the grittiness and immediacy of the film, but makes it much harder to enjoy the performances, stunt work, and fight choreography. If you’re a believer that there’s nothing new under the sun, and that’s just fine with you, “Safe House” is likely to satisfy. It’s like ordering macaroni and cheese at a new restaurant — you aren’t expecting many surprises, but that isn’t why you chose that dish, now is it? You ordered it because you like macaroni and cheese. If you like your movies new and surprising, or if spy action thrillers aren’t your cup of tea, stay away.